As you may or may not have noticed, there is now a friendly Paypal "donate" button located in the right-hand sidebar. Since becoming a nonprofit this fall, Floating World Projects is working on a number of new ideas and events in both artistic and musical spheres, but we need your help to realize our goals. If you donate $50 or more, you will receive a compilation cd featuring FWP musicians. 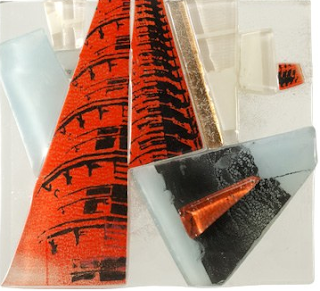 If you donate $100 or more, you will receive a one-of-a-kind, small printed glass piece in varying sizes signed by the artist. These would make excellent and unique gifts for your loved ones for the holidays! Below is an example tile, and there's a gallery of other samples here. We'd really appreciate any support you are able to give, either monetarily or just by getting the word out about our organization! Thanks for reading!